To ensure the 2018 program includes truly cutting-edge and emerging research, a brief, second Call for Proposals will open in May for scientific papers (moderated oral presentation of 18 minutes including questions and discussion) and posters. coverage of an area of research, methodology, or clinical practice. Symposia are 75 minutes in length, presented by professionals with expertise in the topic. A scientific paper is a moderated oral presentation of 18 minutes including questions and discussion. Posters are graphic presentations of a scientific paper. ACRM’s scientific journal, Archives of Physical Medicine and Rehabilitation(ARCHIVES) is the most cited journal in rehabilitation. All abstracts of accepted oral and poster presentations of scientific papers will be published (fully searchable and citable) in the online pages of ARCHIVES. DISCOVER an interprofessional platform where clinicians can inform research and cutting-edge, evidence-based information can inform best practices in clinical rehabilitation. The ACRM Conference attracts a passionate, interdisciplinary mix of rehabilitation pros from around the world. All proposals/abstracts must be submitted online via the ACRM Conference System according to the submission deadlines. To see an outline of the information you will need to enter during the submission process, please download the Proposal Worksheets. Application of biomechanics, motor control, and learning perspectives in rehabilitation. Proposals that are interdisciplinary in nature, or include international or early career presenters are encouraged! All presentations must avoid commercialism. Presentations that constitute promotion and advertising will be prohibited. This includes pervasive and inappropriate use of logos. No advertising matter of any kind may be distributed. No material may be displayed that in any way directly promotes the commercial interest of any company or enterprise, or of the author(s)/presenter(s). If the cost of presentation has been underwritten to any extent, a clear acknowledgment stating support and identifying the particular source should be included (e.g., “The support of [name of corporation/institute] for this project is gratefully acknowledged.”) Statements made in presentations are the sole responsibility of the author(s)/presenter(s). Any statement made should not be viewed as, or considered representative of, any formal stance or position taken on any product, subject, or issue by ACRM. At the time of online submission, submitters must provide complete contact information (e.g., name, credentials, title, institution, mailing address, email, and phone) for all authors/presenters associated with the submission. Further, all submitters, authors, and presenters must submit a current CV or resume and electronically sign a continuing education (CE) agreement and disclosure form. Failure to do so prevents acceptance of a submission. An electronic copy of presentations must be held on ﬁle with ACRM. Presenters for all accepted proposals are required to register for the conference, and are fully responsible for all of their expenses related to the conference (e.g., registration, airfare, hotel, meals). Instructional courses may be proposed for a four-hour or eight-hour time block, allowing presenters the opportunity to discuss and present a topic in depth. Courses should be either instructional in nature, offering in-depth training or knowledge translation on a particular topic; or informative, providing detailed coverage of an area of research, methodology, or clinical practice. Courses may be scheduled as pre-conference sessions on 28, 29, or 30 September 2018 depending upon the length and level of interest in the topic. Instructional courses typically average about 18 attendees each, providing the opportunity for small-group interaction and hands-on activities. The proposal should include a course title, course director/lead presenter, all presenters with credentials and affiliations, detailed course outline, and duration. The submission must describe the instructional method to be used, and the content and format of presentations. It should also identify the intended audience (i.e., researchers, clinicians, administrators). A concise and descriptive summary of the course is also required for marketing purposes. There must be multiple presenters identified. All presenters must furnish necessary disclosure information concerning potential conflicts of interest and must agree to have the course audio or video-recorded for future re-broadcast. Presenters will not be paid a stipend or honorarium. All presentations must be submitted for review prior to the conference. Each complete submission received by the published due date will be independently peer-reviewed. Each proposal is peer-reviewed for the following elements: (1) scientiﬁc, clinical, or didactic quality; (2) interdisciplinary nature; (3) broad appeal to the ACRM membership; (4) timeliness of the topic; (5) and contribution to the state-of-the-art of rehabilitation science. The conference Program Committee reserves the right to offer alternative or reduced time slots for presentations based on submissions. Show how current research can effectively guide clinical practice. Identify clinical questions where additional research data are needed. State a direct relationship between the subject matter and evidence-based practice. The following components are encouraged: interdisciplinary content, presenters from multiple institutions, international presenters, and a point/counterpoint format, as appropriate, for the discussion period. There must be more than one presenter identified. All presenters must furnish necessary disclosure information concerning potential conflicts of interest and must agree to have the course audio or video-recorded for future re-broadcast. Presenters will not be paid a stipend or honorarium. All presentations must be submitted for review prior to the conference. A scientiﬁc paper is a moderated oral presentation of 18 minutes including questions and discussion. Outstanding submissions may be chosen for a longer presentation. AV equipment may be used to supplement the presentation. Posters are graphic presentations of a scientiﬁc paper. Submissions must include objectives, hypotheses, methodology, and results in the abstract (see details below). Submissions with pending results are not accepted. A 275-word abstract must follow one of the two structured abstract formats required for submission of general articles to the Archives of Physical Medicine and Rehabilitation. See the Instructions for Structured Abstracts. The total length of all sections in the submission must not exceed 275 words. Tables or other graphics are not permitted. Submission must include three to five continuing education learning objectives. This is required whether the abstract is eventually selected for CE/CME or not. Submission must indicate all participants in the abstract, listing the lead investigator first, followed by all other participants in the order in which they should appear in print. The submitter has the ability to complete all information for each participant, though we recommend that participants log in to the system to complete the information themselves. Each complete submission received by the published due date will be independently peer-reviewed. There should be no more than ONE presenter identified for Scientific Papers and Posters. Each abstract will be reviewed for the following elements: (1) scientiﬁc and clinical quality; (2) broad appeal to the interests of the ACRM membership; (3) interdisciplinary nature; (4) timeliness of the topic; and (5) contribution to the state-of-the-art of rehabilitation science. All abstracts of accepted papers and posters will be published in the online pages of the ACRM journal, Archives of Physical Medicine and Rehabilitation, October issue, where they will be fully searchable and citable. Archives is the most-cited journal in rehabilitation. Accepted posters will have the opportunity to be considered for the ACRM Poster Awards. Further, a subset of the poster award winners will have the opportunity to present their poster in a Poster Grand Round session. *Posters accepted during the Call for Late-Breaking Research will be published with a later issue of the journal and will not be eligible for poster awards. 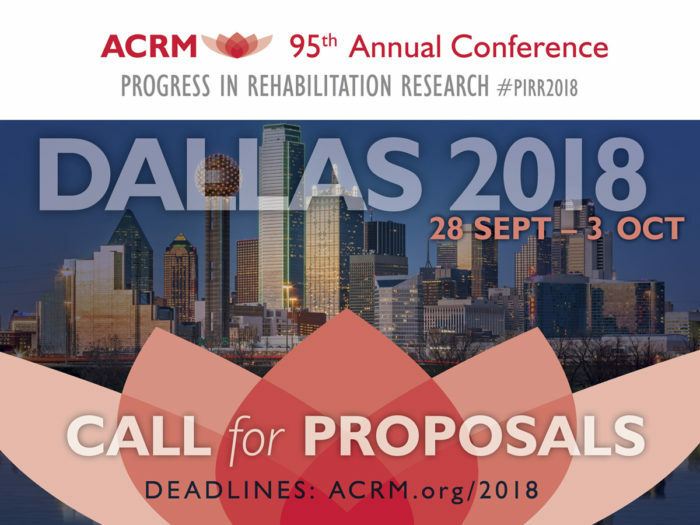 Each proposal (instructional courses, symposia, scientific papers and posters) will be reviewed for the following elements: (1) scientiﬁc and clinical quality; (2) broad appeal to the interests of the ACRM membership; (3) interdisciplinary nature; (4) timeliness of the topic; and (5) contribution to the state-of-the-art of rehabilitation science. To what degree are the concepts, approaches or methodologies, or interventions reflective of rigorous scientific principles, evidence-based research, or other generally accepted principles or practices? To what degree does the research have application in practice? To what degree are the concepts in the abstract relevant to one or more the content topic areas of most interest to ACRM? Interdisciplinary: To what degree are the concepts presented in the abstract relevant to a large number of health professionals and researchers that comprise the ACRM membership? ACRM audiences include: rehabilitation medicine researchers, physicians, nurses, psychologists, counselors, occupational therapists, physical therapists, speech-language professionals, disability management specialists, healthcare executives, dieticians and others. To what degree are concepts/findings presented in the abstract reflective of recently released, significant information? To what degree are the concepts in the abstract a hot topic of interest to a large population of the ACRM audience? To what degree has this research utilized novel theoretical concepts, approaches or methodologies, instrumentation, or interventions? To what degree does this research reflect a refinement, improvement, or new application of theoretical concepts, approaches or methodologies, or interventions? ACRM | American Congress of Rehabilitation Medicine is an organization of rehabilitation professionals from around the world dedicated to serving people with disabling conditions by supporting research that promotes health, independence, productivity, and quality of life; and meets the needs of rehabilitation clinicians and people with disabilities. With the mission of IMPROVING LIVES through interdisciplinary rehabilitation research, ACRM curates and disseminates world-class rehabilitation research — translated for clinical practice — IN PERSON, IN PRINT and ONLINE.